Manning attended Isidore Newman School, where he played football and basketball. In his high school career, Manning passed for 7,389 yards and 89 touchdowns. On February 7, 1999, he committed to play college football at Ole Miss. During his years with the Rebels at Ole Miss, Manning set or tied 45 single-game, season, and career records. His career numbers include 10,119 passing yards (fifth on the SEC career list), 81 touchdown passes (third on the SEC career list), and a passer rating of 137.7 (tied for sixth on the SEC career list). As a freshman, Manning competed with veteran Romaro Miller for the starting quarterback position. Manning saw little playing time behind Miller. He appeared in six games and passed for 170 total yards and one interception. With the departure of Miller, Manning became the Rebels' starting quarterback as a sophomore. In the first game, against Murray State, he passed for 271 yards and five passing touchdowns. In the following game, a loss to Auburn, he had 265 passing yards, one passing touchdown, and one interception. Over the next few games, Manning helped lead the Rebels to victories over Kentucky, Alabama, and LSU. On November 3, in 58–56 loss to Arkansas, Manning passed for 312 passing yards and six passing touchdowns. Overall, Manning had a solid first year as the Rebels' starting quarterback. Manning's junior season started out promising with the Rebels winning their first two games over Louisiana-Monroe and Memphis. Manning had four passing touchdowns and one interception in those two games. In the next game, at Texas Tech, Manning passed for 374 yards, three touchdowns, and one interception in a losing effort. The Rebels won their next three games, which were over Vanderbilt, Florida, and Arkansas State. Manning had five touchdowns and one interception in that stretch. The Rebels' fortunes turned in the latter half of the season with a five-game losing streak. In the stretch was a loss to Arkansas in which Manning passed for 414 yards, two touchdowns, and two interceptions. In addition, he had a rushing touchdown. After a win over rival Mississippi State, the Rebels qualified for the Independence Bowl against Nebraska. Manning passed for 313 yards and one touchdown in the 27–23 victory. Overall, Manning finished with 3,401 passing yards, 21 touchdowns, and 15 interceptions in his junior season. Manning started off his senior season with a 2–2 record. He played well in that stretch with 1,329 passing yards, 11 touchdowns, and four interceptions with victories over Vanderbilt and Louisiana-Monroe but losses to Memphis and Texas Tech. The Rebels went on a six-game winning streak that included victories over major SEC opponents Florida, Alabama, Arkansas, South Carolina, and Auburn. Manning passed for over 1,500 yards, 12 touchdowns, and four interceptions in the winning streak. Overall, he led the Rebels to a 10–3 record and a 31–28 SBC Cotton Bowl Classic victory over the Oklahoma State Cowboys with 259 passing yards and two touchdowns in 2003. He was invited to play in the 2004 Senior Bowl, but chose not to play. As his senior year came to a close, Manning won many awards, including the Maxwell Award as the nation's best all-around player, the Johnny Unitas Golden Arm Award, the National Football Foundation and College Football Hall of Fame Scholar-Athlete Award, the Sporting News Radio Socrates Award, and the SEC Most Valuable Player Award. He was also a candidate for the 2003 Heisman Trophy, finishing third in the voting after winning quarterback Jason White of the University of Oklahoma and University of Pittsburgh wide receiver Larry Fitzgerald. The San Diego Chargers originally held the rights to the first overall pick in the 2004 NFL Draft due to their 4–12 record in 2003. With Manning being the most coveted player in the draft, it appeared that the Chargers' intentions were to draft him first overall. However, Manning (echoed by his father) stated publicly that he would refuse to play for the Chargers if drafted by them. The Chargers selected him with the first pick overall nonetheless, as the team had a deal in place with the New York Giants, whereby the Giants would draft and then trade Philip Rivers and draft picks (used to select linebacker Shawne Merriman and placekicker Nate Kaeding) to the Chargers for Manning. He signed a six-year, $45 million contract with the New York Giants. Manning was one of four quarterbacks taken in the first round of the 2004 NFL Draft along with Ben Roethlisberger, Philip Rivers, and J. P. Losman. Manning, Roethlisberger, and Rivers have all been voted to the Pro Bowl since becoming starters. Until 2013, Roethlisberger and Manning had not produced a season with a losing record (although each had an 8–8 season), and Roethlisberger and Manning have each won two Super Bowls. They have been compared favorably to the Quarterback class of 1983, which included Hall of Fame quarterbacks Dan Marino, John Elway, and Jim Kelly. Manning made his NFL debut in Week 1 against the Philadelphia Eagles. He came into the game toward the end the fourth quarter in relief of Kurt Warner. He finished the 31–17 loss 3-of-9 for 66 yards. 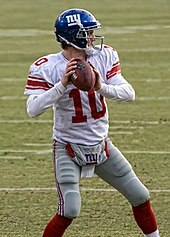 Manning made his first career regular season start against the Atlanta Falcons at Giants Stadium on November 21, 2004. In his fourth start, against the Baltimore Ravens at M&T Bank Stadium on December 12, 2004, he ended the day with a 0.0 passer rating and was benched in the second half in favor of Warner, but remained the Giants starter through the end of the season. The Giants finished with a 6–10 record and were 1–6 in games that Manning started in. 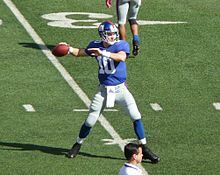 Following 2004, Warner left the Giants, and Manning was named the starter for 2005. Manning led the Giants to a 2–0 record with victories against the Arizona Cardinals and New Orleans Saints, before traveling to the West Coast for a test in a road game agasint the San Diego Chargers. Chargers fans did not forget the snub, and on September 25, 2005 when Manning and the Giants made their first trip to San Diego for a game since that draft day, the crowd booed Manning loudly every time he touched the ball. San Diego defeated the Giants, 45–23, but Manning displayed what may have been his most impressive performance of his young career, going 24-of-41 for 352 yards and two touchdowns. Manning returned home to throw for almost 300 yards and a career-high four touchdowns against the St. Louis Rams at Giants Stadium in a 44–24 romp. Two games later, he led a last-minute drive against the Denver Broncos to secure a 24–23 victory for the Giants. The drive culminated in a two-yard touchdown to Amani Toomer with five seconds remaining. Two weeks later, Manning overcame a weak first half at San Francisco to help his team secure their first official road victory of the season, 24–6. Despite a poor performance at home against the Minnesota Vikings, throwing four interceptions, he again led his team back to tie the game in the final minutes before the Vikings won on a late field goal. Manning's second full season was reminiscent of his 2005 season. He started off playing well and completed over 65 percent of his passes through the first four games. However, he struggled in the second half of the season and his production diminished towards the end of the regular season. After losing a tough game to his brother Peyton and the Indianapolis Colts on opening day, Manning and the Giants rebounded from a 24–7 4th-quarter deficit en route to a 30–24 overtime victory over the division rival Philadelphia Eagles in Week 2. Manning threw for a career-high 371 yards in the win with three touchdowns including a game-winning pass to Plaxico Burress in overtime to earn NFC Offensive Player of the Week. Following a poor performance against Seattle the next week, Manning and the Giants responded by winning five straight games including wins over the Washington Redskins, Dallas Cowboys, and Atlanta Falcons to push their record to 6–2. Following this winning streak, key injuries including one to receiver Amani Toomer pushed Manning and the Giants into a downward slide. Playing against the Chicago Bears, Manning started well, but the Giants' offense was derailed by the loss of left tackle Luke Petitgout to a broken leg. Manning was held to only 141 yards passing with two interceptions. Petigout's loss left a gaping hole at the crucial left tackle position, and Manning was unable to repeat his first-half success. Manning struggled the next week at Jacksonville and the week after that, a costly interception helped to culminate a huge collapse at Tennessee, with the Giants seeing a 21-point fourth quarter lead simply evaporate. Manning improved the following week, throwing for 270 yards and two touchdowns, but the Giants lost again. Finally regaining momentum, Manning threw three touchdowns in a win on the road against the Carolina Panthers, but then he stumbled badly in the final three games. He threw two interceptions against the Eagles and tallied only 73 passing yards in a game against the New Orleans Saints. Although the Giants battled back to 8–8 the following week on the road against the Washington Redskins, Manning completed only 12 of 26 passes for 101 yards and one touchdown. The Giants qualified for the postseason as the #6-seed and met the Philadelphia Eagles. Although he did significantly better in this game than the 2005 playoff game against the Carolina Panthers, completing 16 of 27 passes and two touchdowns, the Giants lost in the Wild Card Round on a last-second field goal by the Eagles. Manning opened the 2007 season with an outstanding personal performance against the Dallas Cowboys, completing 28 of 41 passing attempts for 312 yards, four touchdowns, and an interception, but suffered a shoulder sprain and was removed from the game late in the second half. Although he did play against the Green Bay Packers in week 2 while throwing for 211 yards with one touchdown, the Giants defense performed poorly again and the team dropped to 0–2 with Green Bay winning, 35–13. In week three, Manning got a come-from-behind victory as the Giants defense improved, pitching a shutout in the second half and stopping the Washington Redskins on a fourth and goal situation, winning the game 24–17. The Giants defense then shut down the Philadelphia Eagles with an NFL record-tying 12 sacks, holding the Eagles offense to one field goal. The Giants won with a score of 16–3. The following week, Manning overcame a dismal first half to throw for two second-half scores in a 35–24 win over their in-city rivals, the New York Jets. The following week in a 41–17 loss to the Minnesota Vikings, Manning threw four interceptions and had three of them returned for touchdowns. He continued to struggle until the last game of the season, against the 15–0 New England Patriots. With a playoff spot secured, the Giants could have rested their starters for the playoffs, but they instead chose to keep in the regulars and attempt to stop New England's quest for an undefeated regular season. The Giants lost 38–35, with Manning completing 22 of 32 passes for 252 yards, with four touchdowns and one interception. The Giants entered the playoffs as the #5-seed. On January 6, 2008, in the Wild Card Round, Manning went 20-of-27 for 185 yards playing on the road against the Tampa Bay Buccaneers. The underdog Giants won 24–14, and Manning had two touchdown passes. On January 13, 2008, in the Divisional Round Manning led the Giants to an upset victory over the heavily favored Dallas Cowboys, the number one seed in the NFC. For the third straight game, Manning played well, completing 12 of 18 passes for 163 yards and two touchdowns with no interceptions. The Giants were the first team to beat an NFC number one seed in the Divisional Round since the start of the 12-team format in 1990. This victory secured an NFC Championship berth against the Green Bay Packers on Sunday, January 20, 2008. In the NFC Championship, the Giants beat the Packers in overtime, with a score of 23–20. The dramatic victory secured Manning and the Giants a trip to Super Bowl XLII. This was the first Super Bowl appearance for the New York Giants since Super Bowl XXXV in 2001, and their first Super Bowl victory since Super Bowl XXV. Manning and the Giants opened the 2008 season with a win over their division rivals, the Washington Redskins, 16–7. "It was a great opening to the season", said Manning, who completed 19 passes of 35 for 216 yards, and had one rushing touchdown and one interception. "There was a lot of emotion, a lot of excitement. You could feel it in the crowd." In the Giants' next game, against the St. Louis Rams, they won again, 41–13, behind a stellar Manning performance. Manning finished the game with 20 completions, 260 yards passing and threw three touchdowns to three different receivers. The victory also marked the team's fourth straight victory over the Rams. The following week, Manning rallied the Giants to more fourth quarter magic, overcoming a late deficit to throw the go-ahead touchdown pass to tight end Kevin Boss, and then in overtime, throwing a clutch 31-yard pass to Amani Toomer in the Giants' 26���23 win over Cincinnati Bengals. The fourth week of the season saw the Giants score on each of their first six possessions and dominate the Seattle Seahawks, 44–6. Manning threw for two touchdowns, completing 19 of 25 passes for 267 yards as the Giants totaled 523 yards on offense, their most since 2002. Following a poor team performance in a 35–14 loss on the road against the Cleveland Browns, Manning and the Giants responded with a 29–17 win over the 49ers and battled to a hard earned 21–14 win over the Pittsburgh Steelers at Pittsburgh's Heinz Field. Manning completed 19 of 32 passes for 199 yards and one touchdown in the crucial win, which pushed the Giants to a 6–1 record. The following week, the Giants beat the Dallas Cowboys at home 35–14 to get to 7–1 at the midway point of the regular season. Manning threw three touchdowns in the game. New York improved to 8–1 with a 36–31 win on the road against the Philadelphia Eagles. Manning threw two touchdowns in the victory, but the crucial play occurred in the third quarter. With the Giants trailing by four, Manning appeared to make an illegal forward pass to tight end Boss. After review, it was determined that the pass was legal. The Giants scored a touchdown two plays later. Week nine pitted the Giants in a battle with the visiting Baltimore Ravens. The Ravens had come into the game with the league's third-ranked defense; nevertheless, Manning led the Giants to a decisive 30–10 victory, improving to 9–1, which included a 200-yard rushing effort by running backs Brandon Jacobs, Derrick Ward and Ahmad Bradshaw. Two weeks later, the Giants faced the Redskins at Washington in their second encounter in the season. Manning threw his first 300-yard game of the season going 21-of-34 with an interception and a 40-yard touchdown pass to Toomer. The Giants beat the Redskins 23–7. In November, Manning was named the NFC Offensive Player of the Month. For the month, Manning threw for 1,036 yards and ten touchdowns, and compiled a 94.9 passer rating while leading the Giants to a perfect 5–0 record. Manning was named to his first Pro Bowl on December 16, making him the first Giants quarterback to earn the honor since Phil Simms in 1993. In week 15, Manning and the Giants visited Texas Stadium, where Tony Romo battled through a lower back contusion and connected with nine different receivers, finishing 20-of-30 for 244 yards and two touchdowns leading the Dallas Cowboys to a 20–8 victory. In week 16 against the Carolina Panthers with NFC homefield advantage on the line, Manning had a passing day of 17 of 27 for 181 yards and no interceptions. Manning led the Giants back from deficits of 21–10 and 28–20 to tie the game with just over three minutes left, including a bullet pass to Domenik Hixon for a key two-point conversion to tie the game at 28. The game was played in freezing conditions. On August 5, 2009, he signed a six-year US$97.5 million contract extension. Manning and the Giants opened the 2009 season with a win over their division rival, the Washington Redskins, 23–16. Manning played well completing 20 of 29 passing attempts for 256, one touchdown and one interception. Manning and the Giants traveled to Dallas to play the Dallas Cowboys in the opening of their new Cowboys Stadium on Sunday Night Football. Manning played outstanding completing 25 of 38 passing attempts for 330 yards, two touchdowns and no interceptions which resulted in a 33–31 win for the Giants on a last second field goal. In Week 3, Manning and the Giants played the Tampa Bay Buccaneers where he completed 14 of 24 passes for 161 yards, two touchdowns and no interceptions and as the Giants had a big lead he was taken from the game at the start of the second quarter, the Giants ended up winning 24–0. In Week 4, the Giants played the Kansas City Chiefs. Manning was playing well up until the start of the fourth quarter when on a play action fake Manning injured his heel while passing downfield to Steve Smith. He stayed in for the next play completing a 54-yard touchdown to Hakeem Nicks. It was discovered that Manning had plantar fasciitis (inflammation of connective tissue within the soles of the feet) and there was speculation he would not play against the Oakland Raiders in Week 5. However, in Week 5, Manning played well, completing eight of ten passes for 173 yards and two touchdowns with the Giants winning 44–7. This was the first time in his career that Manning had a posted a perfect passer rating. After this five-game winning streak, the Giants fell to a four-game losing streak, losing to the New Orleans Saints, the Arizona Cardinals, the Philadelphia Eagles, and the San Diego Chargers before winning again after a bye week on Week 11 when they played the Atlanta Falcons, winning 34–31 in overtime. Against the Falcons, Manning posted a career-high 384 passing yards with three touchdowns and one interception. On Thanksgiving, the Giants traveled to Denver to play the Denver Broncos where they lost 26–6. Manning completed 24 of 40 passes for 230 yards, with no touchdowns and an interception. In Week 14 they played their divisional rivals, the Philadelphia Eagles, and lost 45–38, where it was a close game from the start. Manning passed for a career-high 391 yards, three touchdowns and no interceptions but was not able to win the game. Next week, on Monday Night Football, Manning and the Giants dominated the Redskins, winning the game 45–12. The next week, in the final game in Giants Stadium, Manning and the Giants embarrassed themselves, losing 41–9 against the Carolina Panthers and repeated that feat the next week on the road against the Minnesota Vikings in the final regular season game, losing 44–7 while down 38 points in the 4th quarter. After the games, Manning apologized to the fans for the team's performance. The Giants finished the 2009 season with an 8–8 record and missed the playoffs. The Giants ended the 2010 NFL season with a 10–6 record with losses coming against the Indianapolis Colts, the Tennessee Titans, the Dallas Cowboys, the Philadelphia Eagles and the Green Bay Packers. 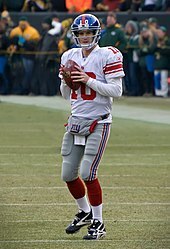 Manning led the Giants to a 17–14 win in the last game of the season against the Washington Redskins, however, because of Green Bay Packers 10–3 win over the Chicago Bears, the Giants did not make the playoffs. He ended the season with 4,002 yards, a career-high 31 touchdowns, but also a career-high 25 interceptions, which marked the most by a quarterback in the 2010 season, and a 62.5 completion percentage. The Giants opened the 2011 season with a slow start, losing to the rival Washington Redskins 14–28 in an emotional game for both fanbases on the 10th anniversary of the September 11 attacks. Manning completed 18 of 32 passes for 268 yards but threw a costly interception in the third quarter to linebacker Ryan Kerrigan, who returned it for a touchdown and swung the momentum of the game. However, the Giants would recover and win their next three games, including over the arch-rival Philadelphia Eagles, where he had 254 passing yards and four touchdowns in the 29–16 victory to earn NFC Offensive Player of the Week. During this streak, Manning improved, throwing for eight touchdowns and one interception. After a 6–2 start, including a 24–20 last-minute comeback by Manning over the New England Patriots that evoked comparisons to Super Bowl XLII, the Giants entered a tough stretch of their schedule, facing off against the San Francisco 49ers, the New Orleans Saints, and the Green Bay Packers, the respective eventual NFC West, South, and North champions. The Giants would lose all three games as well as falling to the Philadelphia Eagles at home, leading them into a 4-game skid and once again putting their postseason hopes in jeopardy. However, unlike the previous three seasons, the Giants would finish strong, winning three of their last four games. This included a key win over their crosstown rival New York Jets as well as a sweep of their fellow division rival Dallas Cowboys. In the final regular season game against the Cowboys, Manning threw for 346 yards and three touchdowns, giving the Giants the win, the NFC East title, and a playoff berth for the first time in three years. He earned a Pro Bowl nomination for his performance in the 2011 season. The Giants entered the 2011 postseason as underdogs, with the lowest winning record of any NFC team. However, Manning and his team would once again demonstrate their endurance and durability late in the year. The Giants first easily routed the Atlanta Falcons 24–2 in the Wild Card Round and then stunned the defending Super Bowl champions and top-seeded Green Bay Packers in the Divisional Round to advance to the NFC Championship Game. In the win, Manning completed 21 out of 33 attempts and threw three touchdowns and one interception. The following week, the Giants avenged their regular season loss to the San Francisco 49ers with a dramatic 20–17 overtime win in the NFC Championship Game. In the game, Manning set franchise playoff records with 32 completions on 52 attempts, good enough for 316 yards and two touchdowns despite being sacked a franchise-record-tying six times. This victory secured Manning and the Giants a second trip in five years to the Super Bowl, setting up a highly anticipated Super Bowl XLII rematch against Tom Brady and the New England Patriots. The Giants also made history as the first Super Bowl team ever team outscored in the regular season (394 points scored, 400 points allowed). In the most-watched program in the history of United States television, Manning once again led the Giants to an upset victory over the 2½ point favored Patriots 21–17, his second Super Bowl win and the fourth overall for the franchise. While trailing the Patriots 15–17 in the final minutes, Manning led the Giants 88 yards down the field to a touchdown that many observers described as "accidental". With just over a minute of time left in the game, the Giants called a running play and Manning handed off the ball to Ahmad Bradshaw with the hopes of stopping short of the goal line and forcing the Patriots to use their final time out, thus allowing the Giants to run out the clock. The Patriots, in turn, did not attempt to tackle Bradshaw in his run, and he then fell over the goal line despite making an attempt to stop. However, the remaining time was not enough for Patriots quarterback Tom Brady to lead a comeback and the Giants held onto the lead to win. Manning was again named the Most Valuable Player of Super Bowl XLVI, becoming the third quarterback in a row to win the award. The Giants also became the first team ever with fewer than ten wins in a 16-game regular season to win the Super Bowl. Manning also became the first quarterback in NFL history to throw for 4,900+ yards and win a Super Bowl in the same season. The Giants were the first team with a running game ranked last (32nd) and a defense ranked as low as 27th to win a Super Bowl. The Giants endured a disappointing season following up their Super Bowl run in 2011. Manning led the Giants to a 6–2 record to begin their season, including a career-best 510 yards in a Week 2 win over the Tampa Bay Buccaneers (second only to Phil Simms' 513 in 1985 for the franchise record), overcoming three interceptions and a fumble. However, Manning averaged an anemic 204 yards per game and 74.3 passer rating over games 8–15, including his lowest rating in five years (38.9) in a 0–34 loss to the Atlanta Falconsin Game 14. He ended the 2012 season on a high note, throwing a career-high five touchdown passes while completing 13 of 21 pass attempts and passing for 208 yards with no interceptions, in a 42–7 Giants win over the Philadelphia Eagles. He finished the season with 26 touchdown passes, 15 interceptions, and 3,948 passing yards. As was typical for this phase of his career (2012–16), Manning was exceptionally well-protected by his offensive line; he was sacked just 19 times for a league-lowest 3.4% of passing plays. Although the Giants did not qualify for the playoffs with a 9–7 season, Manning was selected to his third Pro Bowl as a second alternate. Manning led the Giants to start off the season with an 0–6 record, the worst regular season start since 1976. He threw 12 interceptions in his first five games. Manning fell to 0–3 against his older brother, Peyton in Week 2's 41–23 loss to the Denver Broncos. He was 28 of 39 for 362 yards, but was intercepted four times. Manning's four interceptions tied his career high and was the fourth time he threw four interceptions in a game. The game between Peyton and Eli was the final professional meeting of the two brothers. In Week 15, Manning threw a career-high five interceptions in a 23–0 loss to the Seattle Seahawks. Manning ended the season with a career-high 27 interceptions. The Giants finished the season 7–9, their first losing record since Manning's rookie year. After an 0–2 start, the Giants won three straight games but subsequently lost their next seven games including a 16–10 loss to the San Francisco 49ers in a game where Manning threw five interceptions, which tied his career high. The Giants won three of their last four games to end the season with a 6–10 record. Manning finished the season with 30 touchdown passes, 14 interceptions, and 4,410 passing yards. A few days before the Giants' regular season opener against the Dallas Cowboys, Manning signed a four-year, US$84 million extension with the Giants. In Week 5, he had a franchise-record 41 completions for 441 passing yards, three touchdowns, and one interception in a 30–27 victory over the San Francisco 49ers to earn NFC Offensive Player of the Week. Through six games, he led the Giants to a 3–3 record and a tie for first place in the NFC East. In Week 8, Manning threw a career-high six touchdowns and 350 yards, but the Giants lost to the New Orleans Saints, 52–49. In Week 14, in a 31–24 victory over the Miami Dolphins, he was 27-of-31 for 337 passing yards and four touchdowns to earn NFC Offensive Player of the Week. After starting the season 5–5, Giants fell to 1–5 the rest of the way to finish 6–10 for the second straight season. In the 2016 season opener against their divisional rival Dallas Cowboys on September 11, Manning threw three touchdowns and one interception for 207 yards, as the Giants would hang on to win 20–19. On October 16, in a victory over the Baltimore Ravens, Manning threw for three touchdowns, reaching a career total of 302 touchdown passes and passing John Elway for seventh all time. Coming off a bye week and on a two-game winning streak, beating the Ravens and the Los Angeles Rams, Manning threw a season high four touchdowns as the Giants would halt a last-second game-winning drive by the Philadelphia Eagles to win 28–23. In a Week 16 loss against the Eagles on December 22, Manning set a career-high of 63 pass attempts in a single game, while throwing one touchdown and three interceptions, surpassing Peyton Manning's record of 21 games with 3+ interceptions with 22. Despite the loss, though, the Tampa Bay Buccaneers lost to the New Orleans Saints later that week 31–24, giving the Giants their first playoff berth since last winning Super Bowl XLVI in the 2011 season. By defeating the rival Washington Redskins in the final week of the NFL season on New Year's Day and, therefore, knocking the Redskins out of playoff contention and bringing their season record to 11–5 (their first winning season since 2012), Manning and the Giants faced the Green Bay Packers in Lambeau Field in the Wild Card Round of the NFL playoffs, as Manning completed 23 of 44 of his passes for 299 yards, while throwing for a touchdown. Manning was back to his playoff self in the game, but was let down by numerous drops by Odell Beckham Jr. and other star playmakers. The Packers would eventually rout the Giants 38–13, ending the Giants season. Manning finished the season recording 4,027 passing, 26 touchdowns, and 16 interceptions with an 86.0 passer rating. Manning started the 2017 off with a 19–3 loss to the Dallas Cowboys on NBC Sunday Night Football. In the game, he had 220 passing yards, but the offense struggled to sustain consistent success. Despite solid performances from Manning, the Giants dropped the next four games to start the season with a 0–5 record, with the last three games of that stretch being lost by a combined 10 points. The Giants broke their losing streak with a 23–10 victory over the Denver Broncos. The success was short-lived as the Giants lost the next game to the Seattle Seahawks by a score of 24–7. During Week 9 against the Los Angeles Rams, Manning finished with 220 passing yards, two touchdowns, and an interception as the Giants lost by a score of 51–17. During the Rams game, he became the seventh quarterback to reach 50,000 passing yards. On November 28, after a 2–9 start to the season, it was announced that Manning would be benched and replaced by Geno Smith in Week 13 against the Oakland Raiders, ending Manning's streak of 210 consecutive regular season games started. The streak was second all-time for quarterbacks behind Brett Favre's 297. Head coach Ben McAdoo also gave Manning the option of starting to keep the streak going but Manning declined, stating that "My feeling is that if you are going to play the other guys, play them. Starting just to keep the streak going and knowing you won't finish the game and have a chance to win it is pointless to me, and it tarnishes the streak." The move was met with backlash from former Giants players and coaches. On December 5, two days after the Week 13 game, Manning was renamed the starter after McAdoo was terminated as head coach. During Week 15 against the Philadelphia Eagles, Manning finished with 434 passing yards, three touchdowns, and an interception. The Giants lost 29–34, allowing the Eagles to clinch a first-round bye. On December 24, against the Arizona Cardinals, Manning passed John Elway to take sole possession of sixth place on the NFL's all-time passing yard list. Manning started the regular season finale against the Washington Redskins. In the 18–10 victory, he had 132 passing yards, one touchdown, and one interception as the Giants ended their disappointing season with a 3–13 record. After two losses to the start the season, Manning and the Giants defeated the Houston Texans by a score of 27–22. Manning was efficient going 25-of-29 for 297 passing yards and two touchdowns. The Giants lost the next five consecutive games, with Manning leading the leagues in sacks for most of that stretch despite an improved running game from rookie Saquon Barkley. Manning had 399 yards passing in the fourth of these losses (Game 7 against the Atlanta Falcons), but was sacked seven times and threw two interceptions in Game 8. Manning rebounded with three touchdowns and no interceptions in the following week's victory over the San Francisco 49ers, and a remarkable 17 completions on 18 attempts for two touchdowns in a win the following week over the Tampa Bay Buccaneers. The Giants went 4–4 over the last eight games of the season to finish 5–11 and last in the NFC East. Manning passed for 4,299 yards, 21 touchdowns, and 11 interceptions on the 2018 season. On April 15, 2019, Manning revealed that he found about the trade of his former teammate Odell Beckham Jr. while watching television one night. ^ "JockBio: Eli Manning Biography". www.jockbio.com. Retrieved February 18, 2019. ^ "Eli Manning, New York Giants, Pro-Style Quarterback". 247Sports. Retrieved February 18, 2019. ^ "2000 Ole Miss Rebels Stats". College Football at Sports-Reference.com. Retrieved February 18, 2019. ^ "Eli Manning 2000 Game Log". College Football at Sports-Reference.com. Retrieved February 18, 2019. ^ "Murray State at Ole Miss Box Score, September 1, 2001". College Football at Sports-Reference.com. Retrieved February 18, 2019. ^ "Ole Miss at Auburn Box Score, September 8, 2001". College Football at Sports-Reference.com. Retrieved February 18, 2019. ^ Drape, Joe (October 19, 2001). "COLLEGE FOOTBALL; Eli Manning Inherits the Reins at Ole Miss". The New York Times. Retrieved February 18, 2019. ^ "Ole Miss at Kentucky Box Score, September 29, 2001". College Football at Sports-Reference.com. Retrieved February 18, 2019. ^ "Alabama at Ole Miss Box Score, October 13, 2001". College Football at Sports-Reference.com. Retrieved February 18, 2019. ^ "Ole Miss at LSU Box Score, October 27, 2001". College Football at Sports-Reference.com. Retrieved February 18, 2019. ^ "Arkansas at Ole Miss Box Score, November 3, 2001". College Football at Sports-Reference.com. Retrieved February 18, 2019. ^ "Eli Manning 2001 Game Log". College Football at Sports-Reference.com. Retrieved February 18, 2019. ^ "Louisiana-Monroe at Ole Miss Box Score, August 31, 2002". College Football at Sports-Reference.com. Retrieved February 18, 2019. ^ "Memphis at Ole Miss Box Score, September 7, 2002". College Football at Sports-Reference.com. Retrieved February 18, 2019. ^ "Ole Miss at Texas Tech Box Score, September 14, 2002". College Football at Sports-Reference.com. Retrieved February 18, 2019. ^ "Vanderbilt at Ole Miss Box Score, September 21, 2002". College Football at Sports-Reference.com. Retrieved February 18, 2019. ^ "Florida at Ole Miss Box Score, October 5, 2002". College Football at Sports-Reference.com. Retrieved February 18, 2019. ^ "Arkansas State at Ole Miss Box Score, October 12, 2002". College Football at Sports-Reference.com. Retrieved February 18, 2019. ^ "2002 Ole Miss Rebels Schedule and Results". College Football at Sports-Reference.com. Retrieved February 18, 2019. ^ "Ole Miss at Arkansas Box Score, October 26, 2002". College Football at Sports-Reference.com. Retrieved February 18, 2019. ^ "Mississippi State at Ole Miss Box Score, November 28, 2002". College Football at Sports-Reference.com. Retrieved February 18, 2019. ^ "Independence Bowl – Nebraska vs Ole Miss Box Score, December 27, 2002". College Football at Sports-Reference.com. Retrieved February 18, 2019. ^ "Eli Manning 2002 Game Log". College Football at Sports-Reference.com. Retrieved February 18, 2019. ^ "Ole Miss at Vanderbilt Box Score, August 30, 2003". College Football at Sports-Reference.com. Retrieved February 18, 2019. ^ "Ole Miss at Memphis Box Score, September 6, 2003". College Football at Sports-Reference.com. Retrieved February 18, 2019. ^ "Louisiana-Monroe at Ole Miss Box Score, September 13, 2003". College Football at Sports-Reference.com. Retrieved February 18, 2019. ^ "Texas Tech at Ole Miss Box Score, September 27, 2003". College Football at Sports-Reference.com. Retrieved February 18, 2019. ^ "Ole Miss at Florida Box Score, October 4, 2003". College Football at Sports-Reference.com. Retrieved February 18, 2019. ^ "Alabama at Ole Miss Box Score, October 18, 2003". College Football at Sports-Reference.com. Retrieved February 18, 2019. ^ "Arkansas at Ole Miss Box Score, October 25, 2003". College Football at Sports-Reference.com. Retrieved February 18, 2019. ^ "South Carolina at Ole Miss Box Score, November 1, 2003". College Football at Sports-Reference.com. Retrieved February 18, 2019. ^ "Ole Miss at Auburn Box Score, November 8, 2003". College Football at Sports-Reference.com. Retrieved February 18, 2019. ^ "2003 Ole Miss Rebels Schedule and Results". College Football at Sports-Reference.com. Retrieved February 18, 2019. ^ "Cotton Bowl – Oklahoma State vs Mississippi Box Score, January 2, 2004". College Football at Sports-Reference.com. Retrieved December 7, 2017. 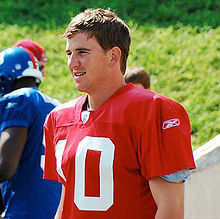 ^ a b "Eli Manning". NFL Players Association. Archived from the original on May 22, 2006. Retrieved March 5, 2008. ^ "Eli Manning 2003 Game Log". College Football at Sports-Reference.com. Retrieved February 18, 2019. ^ a b Collins, David. "Eli Manning's College Statistics & Records". University of Mississippi. Retrieved January 21, 2007. ^ Fitzpatrick, Mike (April 24, 2004). "NFL DRAFT 2004: First-Round Draft Thumbnails". Associated Press. Retrieved March 5, 2008. ^ Serby, Steve (April 24, 2004). "Eli Manning Revisits Drama of the Draft Day That Changed Giants History". New York Post. Retrieved December 17, 2015. ^ "New York Giants at Philadelphia Eagles – September 12th, 2004". Pro-Football-Reference.com. Retrieved January 3, 2018. ^ "Atlanta Falcons at New York Giants – November 21st, 2004". Pro-Football-Reference.com. Retrieved January 3, 2018. ^ "New York Giants at Baltimore Ravens – December 12th, 2004". Pro-Football-Reference.com. Retrieved January 3, 2018. ^ Magee, Jerry (September 21, 2005). "Nothing personal, San Diego; Eli Manning just didn't want to be a Charger". Union-Tribune. Archived from the original on October 3, 2005. Retrieved February 9, 2008. ^ Edelson, Stephen (September 20, 2005). "At 2–0, Giants taking baby steps toward bigger things". USA Today. Retrieved January 22, 2008. ^ "Giants Fall to Chargers, 45–23". giants.com. September 25, 2005. Archived from the original on October 18, 2005. Retrieved January 22, 2008. ^ "Minnesota Vikings at New York Giants – November 13th, 2005". Pro-Football-Reference.com. Retrieved January 3, 2018. ^ "Wild Card – Carolina Panthers at New York Giants – January 8th, 2006". Pro-Football-Reference.com. Retrieved January 3, 2018. ^ Pascale, Joe (November 12, 2006). "Today's big game: Bears (7–1) at Giants (6–2)". SignOnSanDiego.com. Archived from the original on December 6, 2008. Retrieved January 22, 2008. ^ Branch, John (November 28, 2006). "Day After Debacle, the Giants Close Ranks". The New York Times. Retrieved January 22, 2008. ^ "New Orleans Saints at New York Giants – December 24th, 2006". Pro-Football-Reference.com. Retrieved January 3, 2018. ^ "New York Giants at Washington Redskins – December 30th, 2006". Pro-Football-Reference.com. Retrieved January 3, 2018. ^ "Manning (shoulder) in doubt for Giants". Fox Sports. MSN. September 11, 2007. Archived from the original on September 13, 2007. Retrieved January 22, 2008. ^ "Umenyiora, Giants sack Eagles 16–3". Associated Press. October 1, 2007. Archived from the original on November 16, 2007. Retrieved January 22, 2008. ^ "Giants Rally to Defeat Jets 35–24". Boxxet.com. Archived from the original on January 20, 2008. Retrieved November 20, 2007. ^ Michael Eisen (October 15, 2007). "Giants defeat Falcons, 31–10". Giants.com. Archived from the original on February 22, 2008. Retrieved January 22, 2008. ^ Smith, Michael David (October 22, 2007). "Giants Dominate Niners on Both Sides of Ball". The New York Sun. Retrieved January 22, 2008. ^ Palladino, Ernie (October 22, 2007). "Giants look for normalcy as they prepare for London". USA Today. Retrieved January 22, 2008. ^ Lage, Larry (November 18, 2007). "NY Giants 16, Detroit 10". Associated Press. Archived from the original on October 25, 2012. Retrieved January 22, 2008. ^ "Vikings intercept Manning four times, return three for TDs". NFL.com. NFL.com. Associated Press. November 25, 2007. Archived from the original on March 11, 2008. Retrieved March 8, 2008. ^ "The Patriots complete their perfect regular season, beat Giants". NFL.com. NFL.com. Associated Press. December 29, 2007. Archived from the original on January 2, 2008. Retrieved March 8, 2008. ^ "New England Patriots at New York Giants – December 29th, 2007". Pro-Football-Reference.com. Retrieved January 3, 2018. ^ "Giants march on after beating host Buccaneers". NFL.com. NFL.com. Associated Press. January 6, 2008. Archived from the original on March 11, 2008. Retrieved March 8, 2008. 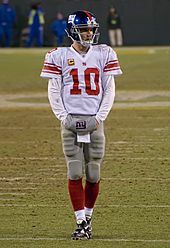 ^ "Third Tynes a charm: Kicker boots Giants into Super Bowl". NFL.com. Associated Press. January 20, 2008. Archived from the original on January 22, 2008. Retrieved January 22, 2008. 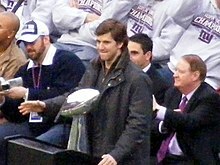 ^ Eli Manning, David Tyree (February 3, 2008). SB XLII Can't-Miss Play: Eli miracle (.flv) (Web video). National Football League. Event occurs at three seconds. Retrieved March 27, 2008. ^ "Patriots nearly perfect, but the Giants are Super Bowl champions". NFL.com. NFL.com. Associated Press. February 7, 2008. Archived from the original on March 9, 2008. Retrieved March 8, 2008. 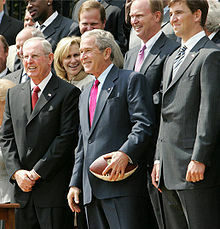 ^ "President Bush Welcomes Super Bowl XLII Champion New York Giants to White House". Office of the Press Secretary. The White House. April 30, 2008. Retrieved April 30, 2008. ^ a b "Super start for Giants, then a battle for victory". NBC Sports. MSNBC.com. Associated Press. September 4, 2008. Archived from the original on September 5, 2008. Retrieved September 14, 2008. ^ "Browns knock Giants from the ranks of the undefeated". NFL.com. NFL.com. Associated Press. October 13, 2008. Archived from the original on December 23, 2008. Retrieved March 22, 2009. ^ "Dallas Cowboys at New York Giants – November 2nd, 2008". Pro-Football-Reference.com. Retrieved January 3, 2018. ^ "New York Giants at Philadelphia Eagles – November 9th, 2008". Pro-Football-Reference.com. Retrieved January 3, 2018. ^ "Baltimore Ravens at New York Giants – November 16th, 2008". Pro-Football-Reference.com. Retrieved January 3, 2018. ^ "New York Giants at Washington Redskins – November 30th, 2008". Pro-Football-Reference.com. Retrieved January 3, 2018. ^ a b "Giants.com – The Official Website of the New York Giants". Archived from the original on December 17, 2008. Retrieved December 16, 2008. ^ "NFL Football Schedule – 2009 NFL Schedule". ^ "New York Giants at Dallas Cowboys – September 20th, 2009". Pro-Football-Reference.com. Retrieved January 3, 2018. ^ "New York Giants at Tampa Bay Buccaneers – September 27th, 2009". Pro-Football-Reference.com. Retrieved January 3, 2018. ^ "Oakland Raiders at New York Giants – October 11th, 2009". Pro-Football-Reference.com. Retrieved January 3, 2018. ^ "Falcons vs. Giants – Game Summary – November 22, 2009 – ESPN". ESPN.com. Retrieved January 25, 2018. ^ "New York Giants at Denver Broncos – November 26th, 2009". Pro-Football-Reference.com. Retrieved January 3, 2018. ^ "Philadelphia Eagles at New York Giants – December 13th, 2009". Pro-Football-Reference.com. Retrieved January 3, 2018. ^ Reid, Jason (December 22, 2009). "Giants embarrass Redskins, 45–12". Retrieved January 25, 2018 – via www.washingtonpost.com. ^ "Carolina Panthers at New York Giants – December 27th, 2009". Pro-Football-Reference.com. Retrieved January 3, 2018. ^ "New York Giants at Minnesota Vikings – January 3rd, 2010". Pro-Football-Reference.com. Retrieved January 3, 2018. ^ Ehalt, Matt (August 18, 2011). "Eli Manning: I'm in class with Tom Brady". ESPN New York. Retrieved March 14, 2012. ^ "New York Giants at Washington Redskins – September 11th, 2011". Pro-Football-Reference.com. Retrieved January 3, 2018. ^ "New York Giants at Philadelphia Eagles – September 25th, 2011". Pro-Football-Reference.com. Retrieved April 3, 2018. ^ "Giants shock Patriots in final seconds as Eli Manning one-ups Tom Brady". ESPN.com. November 6, 2011. ^ "Wild Card – Atlanta Falcons at New York Giants – January 8th, 2012". Pro-Football-Reference.com. Retrieved January 3, 2018. ^ "Eli Manning brilliant as Giants oust top-seeded Packers to book spot in title game". ESPN.com. January 15, 2012. ^ "Giants stun 49ers with OT field goal to set up Super rematch with Patriots". ESPN.com. January 22, 2012. ^ "Tampa Bay Buccaneers at New York Giants – September 16th, 2012". Pro-Football-Reference.com. Retrieved December 3, 2018. ^ "New York Giants at Atlanta Falcons – December 16th, 2012". Pro-Football-Reference.com. ^ "Philadelphia Eagles at New York Giants – December 30th, 2012". Pro-Football-Reference.com. Retrieved January 3, 2018. ^ Eisen, Michael. "QB Eli Manning added to 2013 Pro Bowl". New York Giants. Archived from the original on October 23, 2017. Retrieved January 25, 2018. ^ "Denver Broncos at New York Giants – September 15th, 2013". Pro-Football-Reference.com. Retrieved January 3, 2018. ^ "Seattle Seahawks at New York Giants – December 15th, 2013". Pro-Football-Reference.com. Retrieved January 3, 2018. ^ Mazzeo, Mike. "Eli becomes Giants' all-time passing leader". ^ "San Francisco 49ers at New York Giants – November 16th, 2014". Pro-Football-Reference.com. Retrieved January 3, 2018. ^ "San Francisco 49ers at New York Giants – October 11th, 2015". Pro-Football-Reference.com. Retrieved April 3, 2018. ^ "New York Giants at New Orleans Saints – November 1st, 2015". Pro-Football-Reference.com. Retrieved January 3, 2018. ^ "New York Giants at Miami Dolphins – December 14th, 2015". Pro-Football-Reference.com. Retrieved April 3, 2018. ^ "New York Giants at Dallas Cowboys – September 11th, 2016". Pro-Football-Reference.com. Retrieved January 3, 2018. ^ "Baltimore Ravens at New York Giants – October 16th, 2016". Pro-Football-Reference.com. Retrieved January 3, 2018. ^ "Philadelphia Eagles at New York Giants – November 6th, 2016". Pro-Football-Reference.com. Retrieved January 3, 2018. ^ "New York Giants at Philadelphia Eagles – December 22nd, 2016". Pro-Football-Reference.com. Retrieved January 3, 2018. ^ Breitenbach, John. "NYG-GB grades: Passing game leads Packers to victory – NFL Analysis – Pro Football Focus". www.profootballfocus.com. ^ "Wild Card – New York Giants at Green Bay Packers – January 8th, 2017". Pro-Football-Reference.com. Retrieved January 28, 2018. ^ Smith, Michael David. "Eli Manning, Larry Fitzgerald share Man of the Year Award". nbcsports.com. Retrieved February 8, 2017. ^ "New York Giants at Dallas Cowboys – September 10th, 2017". Pro-Football-Reference.com. Retrieved January 28, 2018. ^ "New York Giants at Philadelphia Eagles – September 24th, 2017". Pro-Football-Reference.com. Retrieved January 28, 2018. ^ "New York Giants at Tampa Bay Buccaneers – October 1st, 2017". Pro-Football-Reference.com. Retrieved January 28, 2018. ^ "Los Angeles Chargers at New York Giants – October 8th, 2017". Pro-Football-Reference.com. Retrieved January 28, 2018. ^ "New York Giants at Denver Broncos – October 15th, 2017". Pro-Football-Reference.com. Retrieved January 28, 2018. ^ "Seattle Seahawks at New York Giants – October 22nd, 2017". Pro-Football-Reference.com. Retrieved January 28, 2018. ^ Stites, Adam. "Eli Manning is 7th quarterback to eclipse 50,000 career passing yards". SB Nation. Retrieved November 5, 2017. ^ Raanan, Jordan. "Manning streak to end as Giants go with Smith". ESPN.com. Retrieved November 28, 2017. ^ Patra, Kevin. "Eli Manning to replace Geno Smith as Giants' starter". NFL. Retrieved December 5, 2017. ^ "Philadelphia Eagles at New York Giants – December 17th, 2017". Pro-Football-Reference.com. Retrieved January 3, 2018. ^ "Washington Redskins at New York Giants – December 31st, 2017". Pro-Football-Reference.com. Retrieved January 28, 2018. ^ "Manning throws 2 TDs as Giants beat Texans 27–22 for 1st win". Boston Herald. Retrieved October 30, 2018. ^ Rock, Tom. "Giants lose to Falcons, drop to 1–6". Newsday. Retrieved December 11, 2018. ^ Canavan, Tom (November 18, 2018). "Barkley scores 3 TDs, Manning throws 2, Giants win again". Courant.com. Retrieved December 11, 2018. ^ "2018 New York Giants Statistics & Players". Pro-Football-Reference.com. Retrieved January 22, 2019. ^ Zucker, Joseph. "Pat Shurmur After Giants' Loss to Cowboys: 'I Believe in Eli Manning'". Bleacher Report. Retrieved January 22, 2019. ^ a b c d McCarthy, Michael (January 30, 2008). "Eli's rise could bring lots of zeroes through endorsements". USA Today. Retrieved February 9, 2008. ^ Winkenwerder, Heide (June 1, 2007). "Citizen Watch Signs New York Giants Quarterback Eli Manning To Headline 'Unstoppable' Ad Campaign". Fashion Window. Archived from the original on October 11, 2007. Retrieved February 9, 2008. ^ "Eli Manning & Abby McGrew Wed on the Beach". People.com.